There is nothing more soothing than a small, green picturesque garden and the relaxing sound of birds, chirping around. It’s also not just relaxing, it’s good for you mind and body having a lovely garden. With a little dose of gardening imagination and some basic, building skills and a few good garden tools you can provide these little fellows a cozy place to live and nest, attracting birds is a serious skill and offers many benefits. In the summer you will enjoy their songs while drinking your morning coffee, and in the winter will save a few creatures from the piercing power of wind and snow(here’s some tips to prepare for a snow). Winter is not only uncomfortable for the birds but it is also quite dangerous for their lives, that’s why I always try to have some winter blooming flowers too. During this period of the year, they usually find their carefully collected stocks of food buried under thick layers of snow and ice. But if you manage to create a single bird house, you can provide a shelter for some sparrows or pigeons, which will use it to cuddle together during the long and cold winter nights. Bird feeders, on the other hand are also a very good solution, since they provide food for the birds. 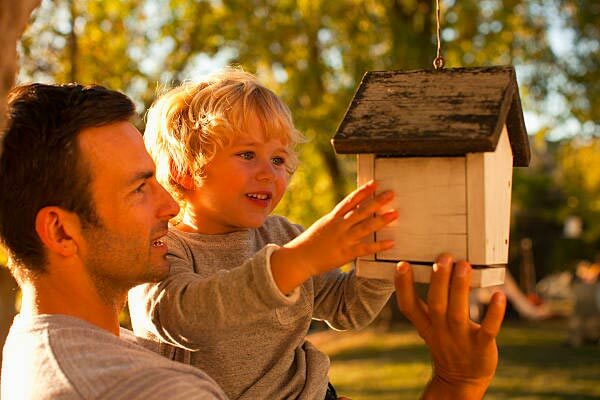 Here we will offer you some useful ideas for building, layout and maintenance of a bird feeder. There are a variety of options to place your bird feeder. You can situate it in the garden, on a special stand; on the wall of the house or somewhere in the branches of a nearby tree. If you live in an apartment, you can put your bird feeder even on the balcony. The food should be placed early in the morning or in the late afternoon. It is advisable to feed the birds at least until the end of March. It is not necessary to provide water, since they are used to drinking from the snow, but if you decide to provide some container for water, it mustn’t be too large, so that animals cannot bath in it. 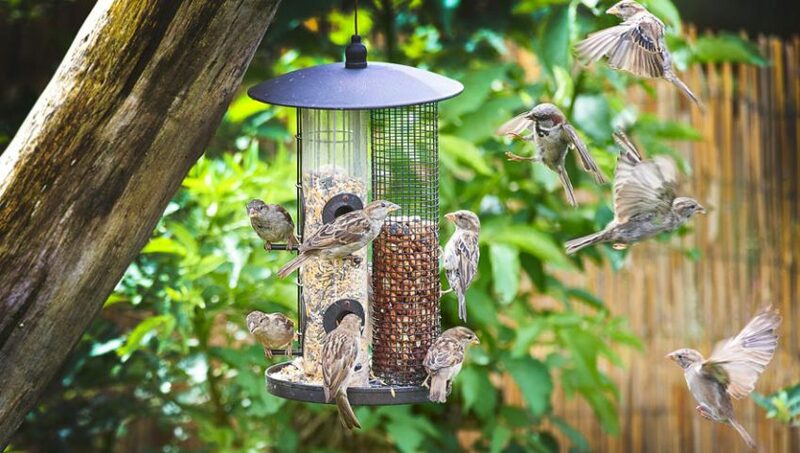 Apart from the regular placement of food, your bird feeder must be kept clean all the time. Drive in the hole one of the two sticks and then repeat the whole procedure a bit higher. These are intended for alighting. Measure approximately 4 centimetres above each hole and make another one, this time a bit smaller, which birds will use for picking the seeds. Of course this hole shouldn’t be too big. Otherwise the seeds will fall out of the bottle. Drive another two wholes in the upper part of the bottle, which will serve as a loop. Hang it on some branch or on your balcony. Another very creative, easy and affordable idea for a bird feeder is an apple (or any fruit) fixed somewhere in your garden. This is also a very good (and eco friendly) way to reduce food waste in your home or at least make some use out of the bowl of fruit, that you bought a week ago as a great source of vitamins for the children and no one seemed to be interested in it.